I have been an artist for my entire life. 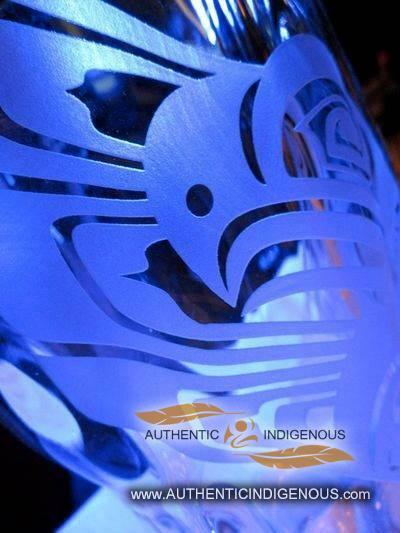 I create work solo and collaboratively showcasing Canada’s heritage and stories in cedar, steel and crystal spirit protocal gifts. 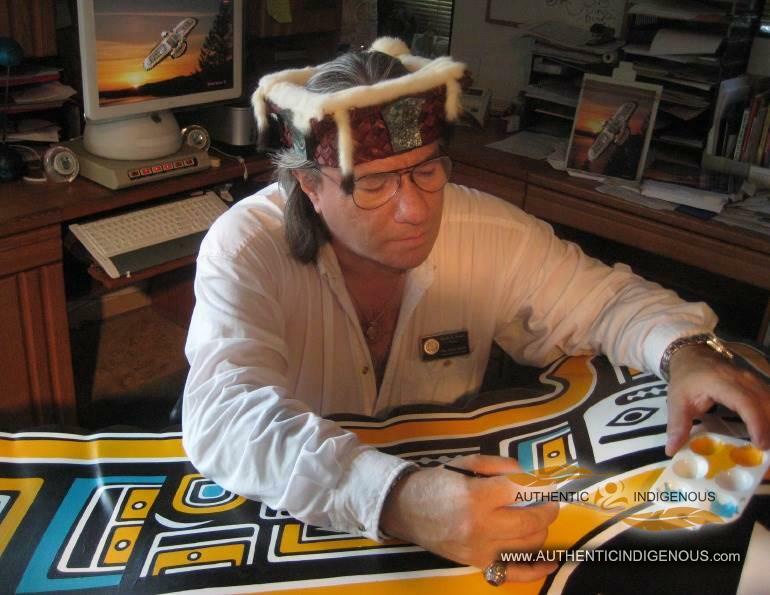 My aboriginal ancestry is Coast Salish, Kwakiutl, Tlingit, Haida. I also have British Explorer and Hudson Bay Trader ancestry. “Heritage Fine Art that Heals and Inspires” Along with my partner Mary Tasi, I also create large public art sculptural pieces and in the last few years have specialized in meaningful community engagement, ambassador work and shared decision making that shares our indigenous legends and mythologies in books and artworks. I started creating large classic red cedar potlatch masks after attending many of my families potlatches along the west coast during my younger years. 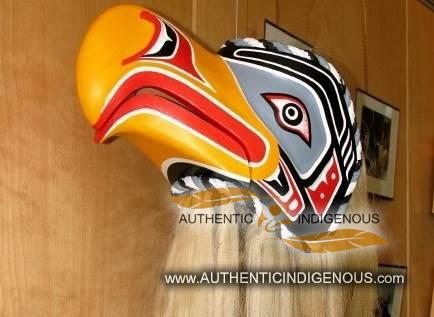 My mother is a hereditary chief of the Kwakiutl people, and I have the authentic rights to create these masks through her four chieftanships. I am also descended from Chief Capilano’s family on my father’s side. In 1995, I started my healing journey, and founded Sky Spirit Studio. With my partner Mary, we collaborate on how we can bring healing story messages to the general public with stories, public art and smaller handcrafted tourism artisanal items. We found that crystal was a wonderful medium to do this as it creates positive energy through light reflections. 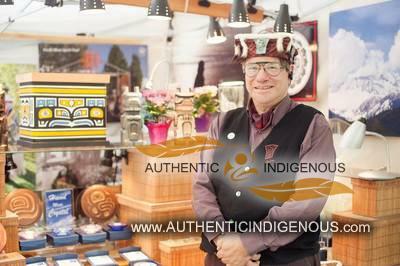 We work in partnerships with our galleries and stores to create unique and healing gift items for locals and tourists. I was also very proud to create one of the millennium coins for the Royal Canadian Mint in 2,000. My double wolf design, symbolizing family, was chosen from 60,000 designs across Canada. I also had the honour of meeting Prince Charles in 2009, during the public unveiling of my stainless steel piece “Canada’s North Star”, created for the Olympic Athlete’s Village. More recently, I won an award of excellence for my cedar and steel contemporary art piece “Gateway to Ancient Wisdom” on the Northshore Spirit Trail. This project also involved mentoring youth to teach them about how to create manufactured bronze disks from their original sketches. I am also honoured to be a Director at Large for Aboriginal Tourism BC, and being part of the new frontier of aboriginal tourism businesses in British Columbia. Our motto is: “Heritage Fine Art that heals and inspires and tells Canada’s story” More recently, I have been honoured to be chosen to create meaningful public art community engagement processes for cross cultural sharing between our indigenous people and mainstream.